The rent at Tymberwood Trace Apartments ranges from $665 for a one bedroom to a $805 one bedroom. Apartments in this building are about as expensive as the Okolona average. This is a pet-friendly apartment. This apartment is in the Okolona neighborhood in Louisville-Jefferson. 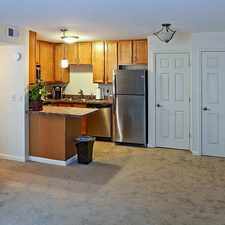 Tymberwood Trace Apartments has a Walk Score of 47 out of 100. This location is a Car-Dependent neighborhood so most errands require a car. Tymberwood Trace, a community offering the finest in apartment living. Tymberwood Trace is designed to offer the latest in modern convenience and unlimited leisure opportunities. Entertainment, fine dining, child-care, expressways, hospitals, schools, colleges and shopping are moments away. We are close to GE, Ford and Louisville International Airport. Step up to the exciting, luxury lifestyle awaiting you, step up to Tymberwood Trace. Proudly owned & managed by Brown Capital LLLP. Explore how far you can travel by car, bus, bike and foot from Tymberwood Trace Apartments. Tymberwood Trace Apartments has some transit which means a few nearby public transportation options. 7500 Beechview Way compared to all of Louisville-Jefferson. How do you feel walking near 7500 Beechview Way? View all Okolona apartments on a map. Tymberwood Trace Apartments is in the Okolona neighborhood. Okolona is the 59th most walkable neighborhood in Louisville-Jefferson with a neighborhood Walk Score of 34.